Step back in time and immerse yourself in the chaotic and highly amusing world of this Noel Coward classic. 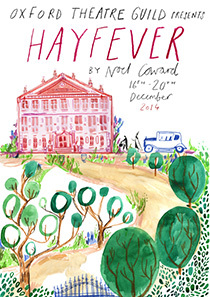 This December, Oxford Theatre Guild brings Summer to Oxford with a classic Coward romp set in the English countryside. "[The OTG] exceeded all expectations of a supposedly amateur group and gave a slick and convincing professional display. Every character was beautifully drawn and defined, every line delivered with authority and weight, every move executed with vigour and confidence. The Guild managed to find a well-balanced cast of genuine talent which made the two hours speed through as if in half the time. This was an energetic, unflagging production in which the directors, Sarah Pyper and Laurence Goodwin, went for it wholeheartedly. The full use of the stage, props and physical acting made for an exceptional entertainment and this reviewer has seen much lesser fare from professional companies this year." 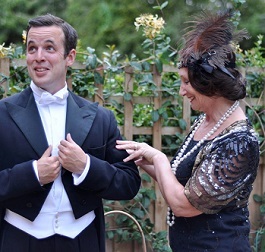 This December, Oxford Theatre Guild brings Summer to Oxford with a classic Coward romp set in the English countryside. 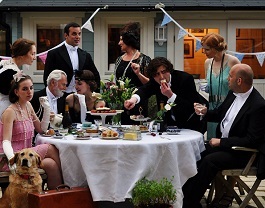 Each member of the bohemian Bliss family has invited a guest for the weekend to their country retreat without the rest of the family’s knowledge. As might be expected chaos ensues thanks to their rude and somewhat shocking behaviour over the weekend including couple swapping, mistaken engagements, parlour games and hiccups! Written and set in 1925, this production incorporates much of the glamour from the period mixed with the quick wit and high jinks one can always expect from Noel Coward. 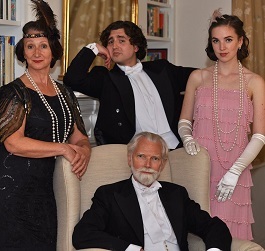 With music and costumes direct from the roaring 20s, Oxford Theatre Guild invites you to step back in time and immerse youself in the chaotic and highly amusing world of this Noel Coward classic. If you have information about the cast of this show, please do get in touch!